Central Ukrainian Relief Bureau (CURB) [Центральне Українське Допомогове Бюро] – a relief agency established after the end of the Second World War to provide assistance to Ukrainian displaced persons and refugees. CURB was founded in September 1945 in London by leading members of the Ukrainian Canadian Servicemen’s Association (UCSA), under the auspices of the Ukrainian Canadian Relief Fund (UCRF) and the United Ukrainian American Relief Committee (UUARC). It was initially based at the UCSA headquarters at 218 Sussex Gardens, London W2. Shortly before closing down it moved to smaller premises at 46 Seymour Street, London W1. CURB was the main vehicle through which Ukrainians in Canada and the USA channelled aid for displaced Ukrainians. It also acted as a coordinating body for relief committees established by the displaced persons themselves in Austria and in the British and American Zones of Occupation of Germany, as well as by Ukrainian communities in various countries including Belgium, France, Italy, Switzerland, Argentina, Brazil and the United Kingdom (the Ukrainian Relief Committee in Great Britain). 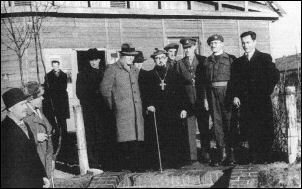 Since most of the CURB activists were members of the Canadian or US armed forces, it was relatively straightforward for them to gain access to the displaced persons camps in continental Europe. The Bureau provided material assistance to Ukrainian displaced persons and refugees, sought to prevent their forced repatriation to the USSR and lobbied for their resettlement in the West. For several months in 1946 a Ukrainian Information Service operated as an adjunct to CURB. In 1947 the Bureau published a monthly periodical, The Refugee. From August to November 1947 CURB ran the Ukrainian Booksellers and Publishers enterprise which was subsequently taken over by the Association of Ukrainians in Great Britain (AUGB). During 1947 CURB devoted considerable attention to helping the large numbers of Ukrainian European Voluntary Workers and former soldiers of the Galicia Division arriving in the United Kingdom. From the beginning of 1948 responsibility for this was taken over by the AUGB. In December 1948, owing to financial constraints, CURB was closed down. For some time thereafter the UCRF and UUARC continued relief operations from their European offices in Germany. Initially, the Bureau’s main office holders were Bohdan Panchuk (director), Stanley Frolick (secretary) and George Kluchevsky (treasurer). From May to October 1946 the director was Frolick. Then Panchuk became director again until December 1947, when he was succeeded by Anthony Yaremovich (January to September 1948). Other staff and volunteers included Dmytro Andrievsky, William (Vasyl) Byblow, Ann Crapleve, Stephen Davidovich, Stephen Jaworsky, Michael Kapusta, Vladimir Korostovetz, George Luckyj, Michael Lucyk, Anne Panchuk, Joseph Romanow, Danylo Skoropadskyj and Peter Smylski. Photo: CURB representatives visiting the Ukrainian displaced persons camp in Heidenau, Germany. December 1945.